Published: Jan. 25, 2016 at 06:15 p.m. Updated: Jan. 25, 2016 at 09:03 p.m.
Tom Brady and Rob Gronkowski made magic throughout the Patriots' final drive in Sunday's AFC Championship Game, but it was the play they didn't make that could haunt both throughout a long offseason. The bruised and battered Brady was a hero on the final drive, hooking up with Gronkowski on a fourth-and-10 for 40 yards, then finding his dynamic All-Pro in the end zone on fourth-and-goal to pull the Patriots within 20-18 with 12 seconds to play. The game hinged on a two-point conversion. 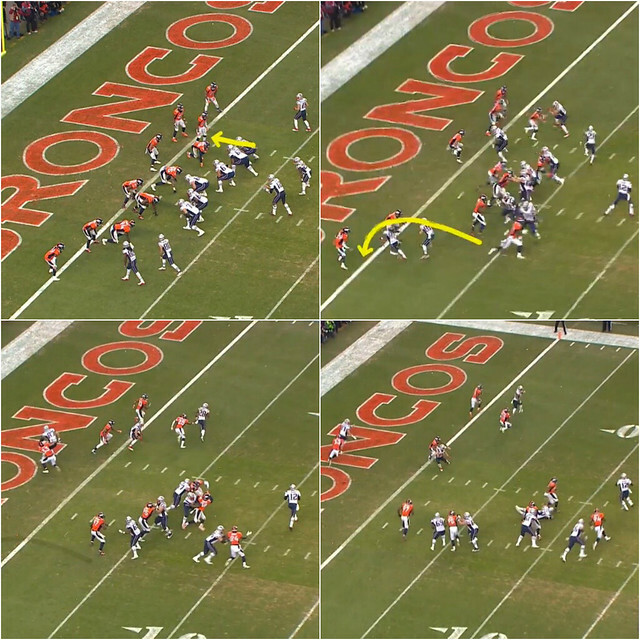 Brady was immediately flushed out of the pocket on a rush from DeMarcus Ware and Brandon Marshall. Gronk -- despite what CBS analyst Phil Simms suggested -- was single-covered by safety Shiloh Keo and flashed open as his route took him into Brady's sightline. Whether it was pressure or simply missing his man, Brady chose to throw across his body toward wide recevier Julian Edelman, who was well covered. The pass was deflected and intercepted.